There are different types of drapery linings that serve different purposes like insulation, light reduction, water repellency, and more. There are many variations of these linings available. Water repellent and resistant drapery lining is designed to protect the face fabric from water stains caused by rain, moisture, and condensation. Blackout drapery lining is made by taking a base fabric and spraying it with acrylic foam, then spraying on a coat of black opaque membrane, then spraying a third layer coat of white. This is 3 pass, there is also 2 pass which skips the first coat. Insulating drapery lining helps to regulate temperature and somewhat dampens sound. It can save on energy costs by reducing heat loss in the winter and blocking heat from the sun in summer. 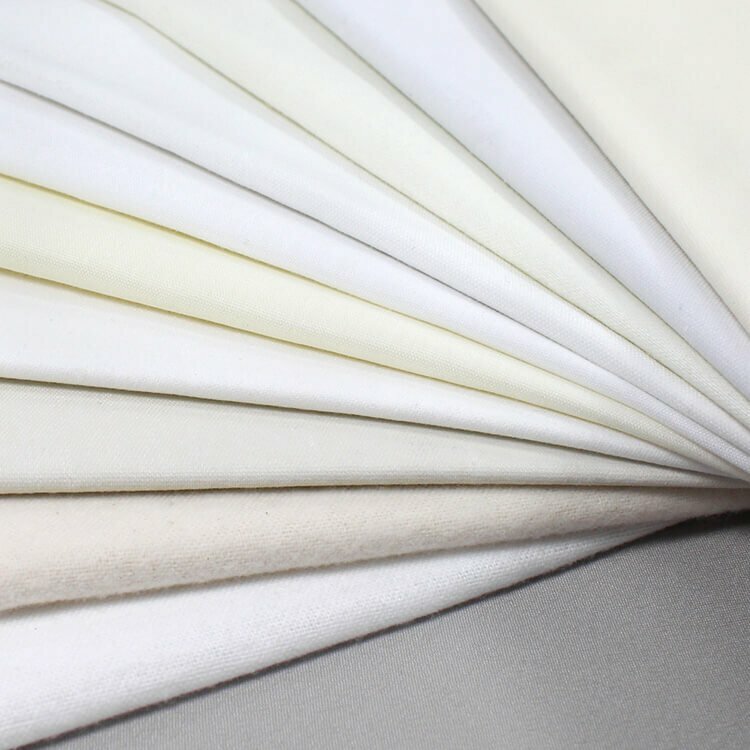 Flame retardant drapery lining, , in addition to complying with fire code, can also sometimes block light and provide some thermal and noise insulation. For more information, read How To Pick Drapery Lining. Check out our selection of drapery lining fabric! What is the best fabric to use for drapes to block sunlight/uv rays (to protect leather chairs) ? I only want to use the lining fabric to keep it as simple + light as possible. Thank you ! BEST ANSWER: Any of the non-blackout linings would work. We've used Roclon Rain No Stain White Drapery Lining for several projects. It lets light through but offers protection from the sun. can i make pillowcases with this fabric? Can this be used as a liner for Roman shades made with a ticking fabric? BEST ANSWER: Most drapery linings will work for Roman shades, but a mid to heavyweight liner is generally the best. Lightweight linings, like Roclon Supra-lon and Hanes Linit, aren't ideal. Do you put the roclon specialsuede lining between the face fabric and a lining or could you just use the suede lining by itself? Interlining needs to be put between so wondering if this also has to? BEST ANSWER: You can use Roclon Specialsuede by itself. It's meant to be a lining, not an interlining, but there's no reason you couldn't use it as interlining. Whether you use an interlining or not is a matter of personal taste. Interlining gives more body to curtains and improves the insulation qualities, but many people choose not to use interlining.